There have been a number of apps created which claim to cure jet lag, but it's possible that Entrain, which is based on mathematical formulas, may finally offer a solution to travelers worldwide. There have been a number of apps created which claim to cure jet lag, but it's possible that Entrain, which is based on mathematical formulas, may finally offer a solution to travelers worldwide. Created by University of Michigan researchers, the app attempts to regulate our biological clock or circadian rhythm, the determining factor of when we feel sleepy or wide awake. The key to controlling your circadian rhythm is exposure to light. If your body receives light at the wrong time or in the wrong way it becomes confused and you are left feeling tired and cranky. The Michigan researchers used mathematical equations to predict someone's circadian rhythm, thus determining different schedules of light exposure for over 1000 different trips. Download the app, answer a few questions and the app calculates a schedule of light exposure and darkness, based on your body clock. Follow the schedule and you should be able to recover from jet lag on your next trip much more quickly than previously. 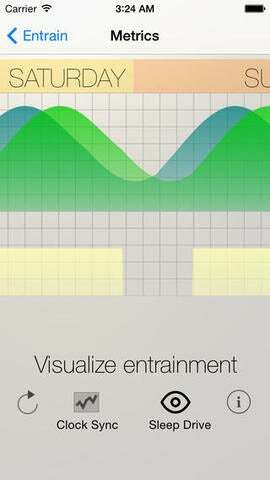 Entrain is a free app for iPhones and Androids. It is currently in the developmental stage.